Hans Collaert the Elder, Netherlandish, after Gillis Coignet, Netherlandish, The Elders Trying to Seduce Susanna, from Thesaurus Sacrarum, 1585. Engraving with transparent and opaque washes. Harvard Art Museums/Fogg Museum, Gift of Barbara Ketcham Wheaton in memory of Robert Bradford Wheaton, 2011.613.169. Page by luminous page, it is a gift that continues to give. 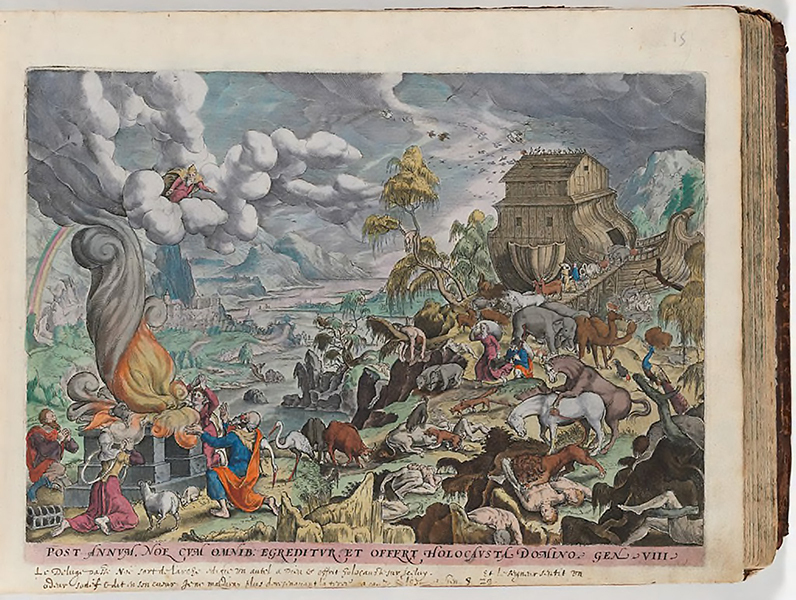 Part of the Harvard Art Museums’ permanent collections, the rare Thesaurus Sacrarum (Sacred Encyclopedia) is a sumptuous 16th-century volume replete with hand-painted engravings of biblical scenes. This treasure was generously given to the museums by Barbara Ketcham Wheaton in memory of her husband, Robert Bradford Wheaton. Like so many others from the late 1500s, the album and its engravings were created and bound in Antwerp, Belgium, then the center of Europe’s publishing industry. The album is from a series made by the famed Gerard de Jode and is one of just nine that survive intact; many others were taken apart and sold page by page, known today only through their individual prints. 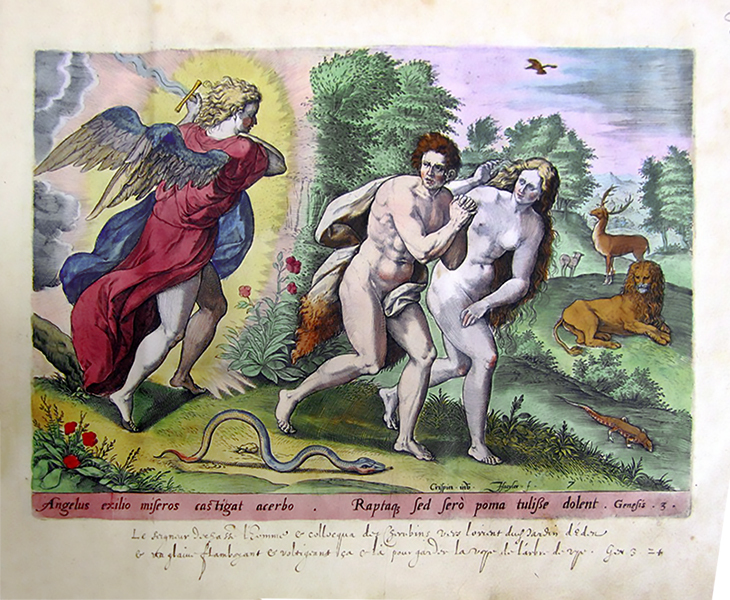 Johann Sadeler I, Netherlandish, after Chrispijn van den Broeck, Netherlandish, The Expulsion from Paradise, from Thesaurus Sacrarum, 1585. Engraving with transparent and opaque washes. Harvard Art Museums/Fogg Museum, Gift of Barbara Ketcham Wheaton in memory of Robert Bradford Wheaton, 2011.613.8. Depicting a range of well-known biblical stories such as “The Elders Trying to Seduce Susanna” and “Belshazzar’s Feast,” the album’s prints juxtapose contrasting colors—bright blue with vivid orange, for example—reflecting contemporary tastes in Northern European painting of the period. 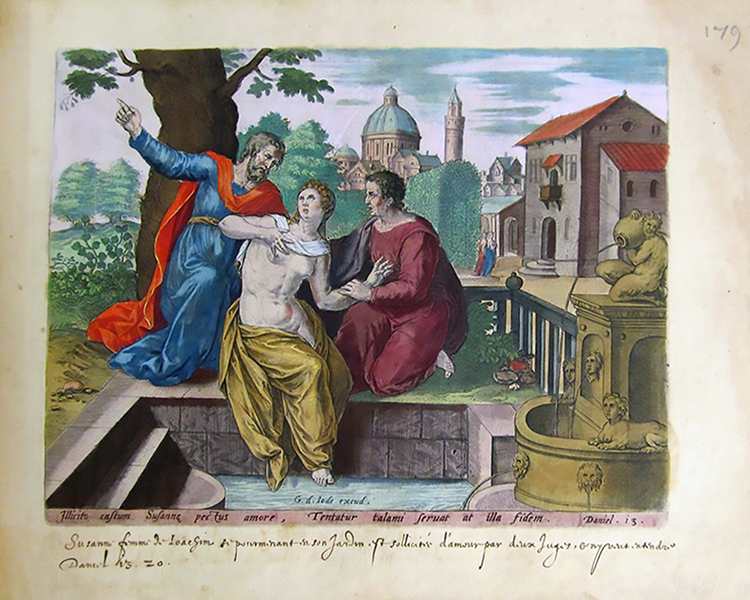 Besides handwritten inscriptions in French identifying the chapter and verse from which each scene derives, the album lacks any other didactic explanations, suggesting an appeal to a broad cross-section of the Christian population. 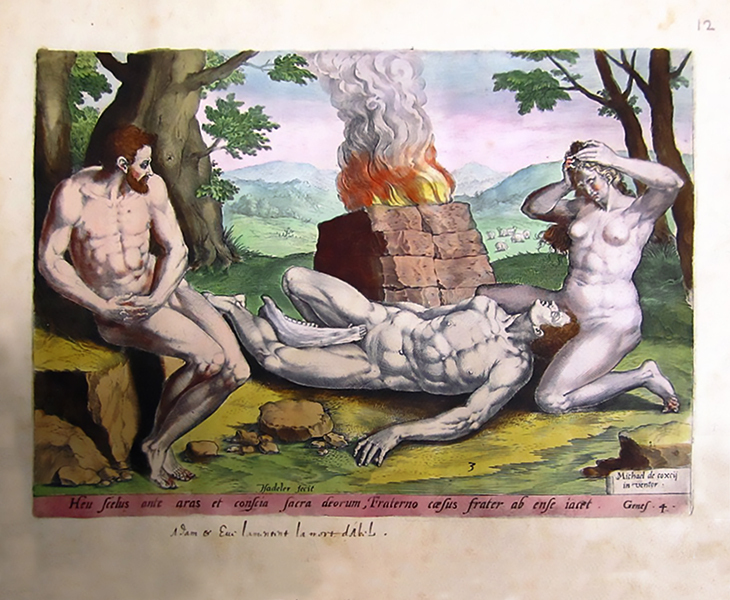 Johann Sadeler I, Netherlandish, after Michiel Coxcie, Netherlandish, History of Cain and Abel, from Thesaurus Sacrarum, 1585. Engraving with transparent and opaque washes. Harvard Art Museums/Fogg Museum, Gift of Barbara Ketcham Wheaton in memory of Robert Bradford Wheaton, 2011.613.10. De Jode most likely produced at least a hundred complete albums and oversaw the creation of about a thousand engravings for the volumes. Bound in fine Moroccan leather by another craftsman, the albums were destined for the libraries of wealthy or otherwise distinguished individuals. After Hans Bol, Netherlandish, Noah’s Ark, from Thesaurus Sacrarum, 1585. Engraving with transparent and opaque washes. 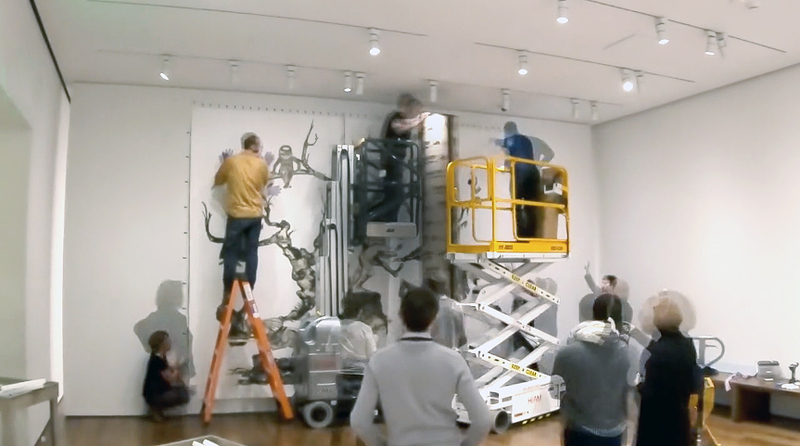 Harvard Art Museums/Fogg Museum, Gift of Barbara Ketcham Wheaton in memory of Robert Bradford Wheaton, 2011.613.12. A rare treasure like the Wheaton album requires special care and planning when on display. Curators, conservators, and collections management staff have worked together to ensure, for example, that stress on the album’s binding is minimized by creating custom-made display mounts, and they control light exposure through a planned series of page turns every four to six months. Despite these extra hurdles, the opportunity to present such a significant object is well worth it. 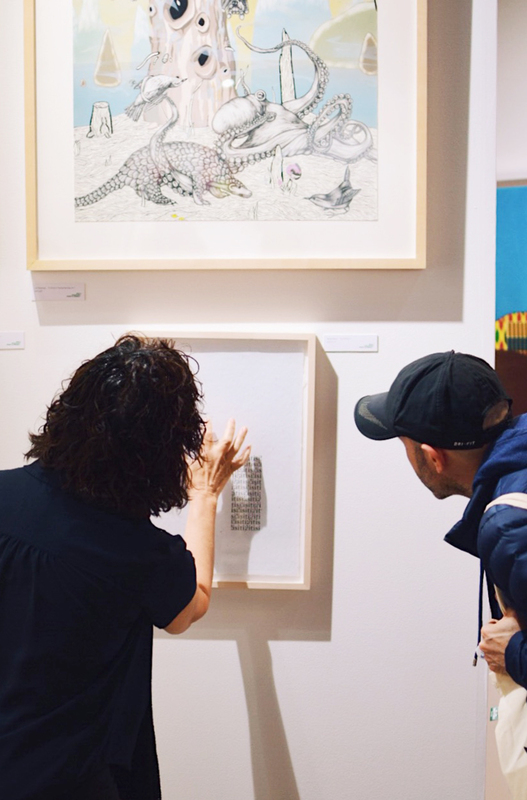 “This is so much more than just a book—it’s a star within our permanent collections,” said Rudy. Be sure to check out the Thesaurus Sacrarum album before it goes temporarily off view in March for cataloging and new photography. The album can be found in Gallery 2500 on Level 2 of the museums.